Situated in Prestatyn on the beautiful North Wales coast, Vehicles for Leisure offer a wide range of quality new and used motorhomes at affordable prices. 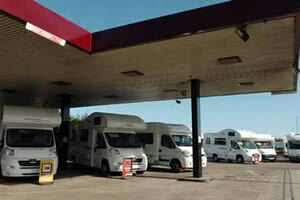 Most used motorhomes come with 12 months MOT, 6 months guarantee, a gas safety check with certificate, full valet, a service including new cambelt, and an electric hook-up lead, all you need is your sleeping bag (which we sell in our fully stocked accessory shop). We are pleased to announce that we now have a branch in Chester. Please feel free to browse through our stocklist, we update it regularly, however if there is a specific motorhome you can not find please contact us and we can add you to our list of customers looking for specific motorhomes.